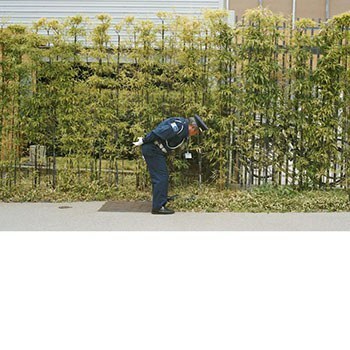 Gold Panda turns a trip to Japan into a synaesthetic sensory experience in his latest LP. Compared to other texture-obsessed electronic artists, Gold Panda's sound seems strangely organic, as if he hunts down and captures the sonic phenomena in his tracks rather than engineering them in the studio. Arrayed next to the churning drone-house of the Field, the hip-hop esotericism of Nosaj Thing, and the voraciously experimental beat-making of Flying Lotus, the London-based producer's approach seems more naturalistic, grounded in earth, even elegantly empirical; this is an artist attuned to the subtle beauty of certain sounds taking shape and seizing vitality, growing from bytes of pitch, volume, and waveform data into living, breathing things. During some moments, you can almost sense him opening his hands and releasing these sounds into the aural ecosystem he's cultivated. On Good Luck and Do Your Best, his first full-length since 2013's darkly kaleidoscopic Half of Where You Live, this elemental aesthetic seems more prominent than ever. These songs contain more than organic qualities. They contain full-fledged organisms, audio-biologies that speed through life stages and gasp for air. The record opens with "Metal Bird", a wistful, guided-by-the-wind rush of melodic electronica that rides forward with such an effortless momentum that it seems to hypnotize itself. It's a paradox of weight: light as air but replete with emotional gravity, sodden with textural color but nearly vaporous. Sonically, it's molded from the same materials as "You", the stammering standout from 2010's Lucky Shiner. Both tracks are configured around anonymous choral effusions, skipping percussion, lithe, pulsating bass, and a central vocal sample repeated so incessantly that it loses its lexical significance and becomes an irrepressible unconscious tic. In "You", this vocal sample was a phonetically torqued version of the title pronoun. In "Metal Bird", it's a lush, beautifully rendered articulation of the syllable "bird", so smothered in breath and emotive intensity that it's nearly unrecognizable. Yet while these two samples are fundamentally different in origin, one in reference to a person and one to an animal, they share a common meaning: "bird", transfigured by Gold Panda into a prism brimming with light, becomes another way of saying "you", perhaps a better way of saying "you", a better way of directly addressing and staring down a lover who has completely infiltrated your psyche. At around the 1:35 mark, this sample suddenly drops away and, in the strange pseudo-silence that follows, you can almost feel this stare down take place. Eye to eye, these lovers size each other up, forgetting to breathe but remembering everything that's at stake. "In My Car", arguably the album's most ambitious and reverie-provoking cut, again finds Gold Panda communicating an intense emotional directness through a heterodox sonic palette. In this case, he reifies this directness through reverb-lacquered choral intonations, sweeping strings, and Eastern instrumental flourishes, best exemplified by the mesmerizing koto ripple-breakdown that begins the song's third act. It's a moment of striking beauty - sudden, razor sharp, and heartrendingly evocative. Moments like these stem from a 2014 trip to Japan that Gold Panda took to compose "a sight and sound documentary." While this project was eventually discarded, this synaesthetic methodology runs throughout Good Luck and Do Your Best; the sounds here enunciate sights, tactile sensations of wind-in-hair and water-on-skin, the colors of night approaching and daytime giving way. "Japan has this light that we don’t get here. It’s hard to explain," Panda said. "You know how L.A. has this dusk feeling - that orange light that makes the place glow, and the neon signs? Well, Japan has this." It's precisely this feeling that suffuses "In My Car": the collapsing-into-itself denouement simulates the experience of this orange dusk being injected directly into your retinas, like it's some psychedelic street drug in a future where natural light is a commodity and neon dominates the visual spectrum. “Time Eater”, another highlight, plants your feet in the middle of a suspension bridge, faced with the enormity of an open sea and exposed to an ice-cold breeze. Then the bridge’s cables begin to break, one after the other, but very slowly, giving you time to react to the snap-and-release of each individual cable as it devolves from an indispensable architectural component to litter strewn about the water below. It’s a slow-motion collapse concocted out of koto pluckings, hisses of ambience, and crackling electronic percussion, but you’re too preoccupied with the beauty of the chaos to care about the fall ahead. Better considered as an 11-track experience than a conventional record, Good Luck and Do Your Best is a work of admirable consistency and tonal clarity. Even tracks as different as the club-ready "Chiba Nights" and the ponderous, melodically spare "I Am Real Punk" feel bound together by a sense of time, place, and mood. Indeed, all of these songs seem to plant your feet in a new setting where humans fade into the background and sound-organisms dominate. Once there, it's a hard setting to leave.